We’re aware of the continuous demand for cheaper and more cost effective ways to send parcels. Price is always a main factor for businesses and consumers and it can be somewhat daunting trying to navigate the main different delivery options available, in order to ensure best price. This is why we have put together our first ever Price Tracker, providing a comparison of the main options available – helping make difficult decisions easier, whilst not only saving you time, but money. 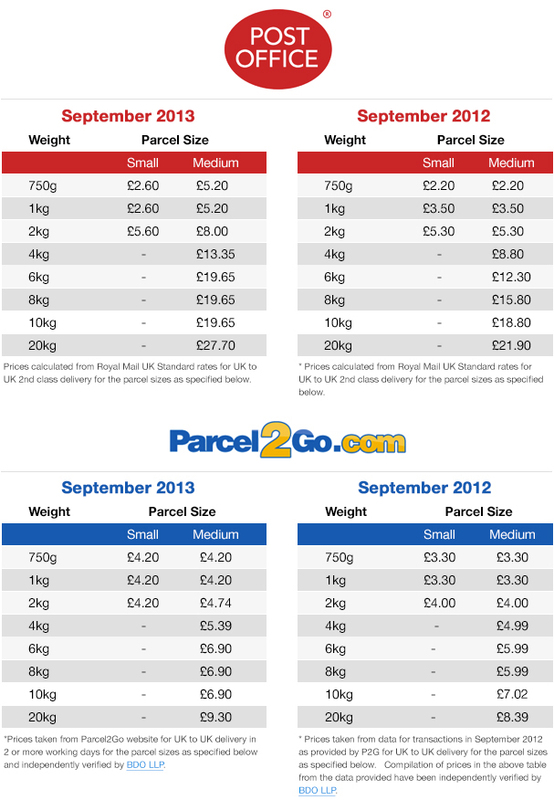 Our Price Tracker is purely focused on UK domestic deliveries, providing costs categorised by parcel size and weight. All P2G prices displayed here include VAT that may be reclaimable by some senders. PO 2012: Small parcels are defined as up to and including 1kg and Medium parcels are defined as up to and including 1kg, both sent as 2nd class Packet; Small Parcels over 1kg and up to 2kg and Medium Parcels over 2kg, both assumed sent as standard parcel and 3-5 working day service. As of September 2013, Small Parcels can measure up to: Length 45cm Width 35cm Depth 8cm and Weight Limit 2kg. As of September 2013, Medium Parcels can measure up to: Length 61cm Width 46cm Depth 46cm and Weight Limit 20kg. Prices are applicable for a mainland UK-UK delivery excluding Northern Ireland, Isle of Wight, Isle of Man, Scottish Highlands and Scottish Islands. Post Office prices have been calculated with reference to the Royal Mail standard rates. Parcel sizes exclude rolled and cylinder shaped parcels.